Larger, faster, meaner types... the best really are other brackish water species... Monodactylus, scats, Chromides, archerfishes... Sometimes members of their own species. There's never been any problem with them attacking their non-puffer tankmates. There was a seventh puffer that became aggressive when it anticipated feeding, and would then chase the other puffers. Introducing livebearers as dither mostly solved this, then they were all removed because of nitrate levels increasing too much. The seventh puffer got bit severely on its face in a feeding accident by another puffer and eventually died. It's been many months since that happened, and even when it still was none of the other fish showed bite wounds. The remaining six have recently begun to show circular bite marks on their bodies (not on their fins), the two largest of them have the least, but they all have bites and they disappear and reappear daily. (The smallest puffer of the group is probably recently mature, it's pattern has noticeably changed in the last few months.) I reintroduced livebearers as dither to solve this problem, but it hasn't worked. I virtually never see any aggression when I feed them or observe them, but the bites come and go so the only answer I can think of is a larger tank. What are the chances a 72" tank would significantly lower the level of biting among the group of six puffers I have? Would a 72" with 24" depth be much better than a 72 with 18" of depth? Is a sole safe to keep with figure 8 puffers (ignoring the problem of food competition)? I used to have a tank with dwarf puffers that ignored a pair of some fish sold as flounders. I don't know if figure 8 puffers are much more dangerous or if it's common for them to bite soles. Which common soles are best for 1.005 sg brackish, and is there any sole from Cynoglossidae that is best for this sg, or they're all unidentifiable and treated the same? <It's incredibly hard to identify "freshwater" flounders and soles, with the exception, perhaps, of Brachirus harmandi. Let me direct you to some notes I wrote a few years ago that may be helpful. How many figure 8 puffers should be kept in a 36 x 18 x 24 65 gallon with heavy planting and strong flow? -Puffers being somewhat "mean" although I don't have experience with the figure eight puffer I know some of the freshwater species can be little boogers. -The archers eventually getting to about 6" and possibly seeing the 2-2 1/2 in puffers as food even thought the puffers seem to be more so rounded out. -Both can tolerate the salt, in this case the puffers requiring the salt, and the Toxotes microlepis being tolerant and not bothered by anything over 1.005sg i believe it was so it seems like a happy medium. -I can still have most of my hardy lowlight plants and jungle Val (one strand is 4ft long haha its crazy how fast its growing in the harder water!) in this salinity. -If the two species do work out together its sure to be an awesome show tank as i am quite the oddball lover and friends keep telling me they want to see me get a puffer....lol of course not without proper research! -Also it will give me some experience with keeping salinity levels stable for when i wish to travel into saltwater...eventually. So lend me some info in terms of compatibility of these two very different species, i have a hunch it wont work but it cant hurt to ask either! Thanks once again Neale! Your comments and info really helped! My tank is a 65 gallon tank 48"long 18 or 16" wide and about 20 "tall, although it seems the width is greater than the height. I ordered some wood that branches off of a single branch and am going to flip it upside down to create a root likes structure for shelter from my relatively bright lighting and for a place to seek shelter. As for the archers, my Lfs is trying to specifically get in the Toxotes microlepis for me as i helped describe the particular species markings with back up support from you when i sent in the "ID this archerfish" email, and have to say because of this, i really love my Lfs. They said the archers will get in at about 2" or so sometimes 3-4" as well. As for the puffers i was getting a bit mixed up in your reply as to whether its just a problem with the archers viewing the puffers as food when young, or even when both species are at full size. The sizes along with the temperament of the puffers (although seems like it could be curved by keeping their environment full of line of sight breaking decor and a full belly of food ) makes it seem as though it boils down to a no when it comes to housing these 2 species in a tank like mine being the 65 gallons. Or is it more of a case of keeping up with the needs of both fish to keep them happy? Will the archers be guaranteed to try and go after the puffers when at full size even if both are introduced to the system at a relatively same size and or time? Sorry for all the questions, i just really enjoy researching fish hahaha...sold my Xbox for aquarium plants, now tell me that's not dedication! Is there a better sense of security between them when they are in groups, as i recall you informing me that a single archer alone will be fine alone. I assume the space issue is due to the 5-6 5 inch archers versus the smaller puffers even though the puffers are quite the messy eaters and producers of ammonia as well. <Yes. Do also peruse today's FAQs; we had one message from someone who had a Figure-8 that dismembered her Mollies! These fish are NOT predictable. Ruling the puffer fish out. Was just curious about them more so. Can you recommend any other fish? Or are 5 Toxotes microlepis in a 65 gallon tank pretty full already? i really like the African brown knife fish, and their smaller size compared to other knife fish seems to make them a good choice for my size tank. I picked up 2 apple snails today and I was wondering if it is possible to keep them in my brackish tank with my figure 8 puffers. I understand that they have a trap door which will inhibit the puffers from eating it and they're quite big, so the puffers probably won't be able to get their little mouths around it. My salinity is roughly 0.004, no lower than 0.003 and no higher than 0.005. Can the apple snail survive in that level of brackish? Will my puffers manage to eat it ? Thanks for quick response...I see I made a typo error, my brackish tank isn't 0.004...it's 1.004. Silly me. Anyway, I forgot to ask another question about the apple snail. I read online that they may even eat other snails. I have them with my red ramshorns which are laying eggs like it's going out of fashion and I don't want the apple snails to now devour all my other baby snails I'm breeding as food for my puffs. Would it be advisable to get rid of them all together and stick to the ramshorns? Also, I had a situation where I decided to add a couple of mollies to the brackish tank with my f8's. I came home one day to find one floating with it's head and fins chomped off and I swear all the puffs had a guilty look on their faces. Today, at the petstore, I was told by a very experienced fish keeper that if I want to add any other fish with f8's, I should remove the puffers, rearrange the tank, put the new fish in first and then add the puffers afterwards, to give them the idea that they are new and it's not their territory that a new fish has entered. Or will the f8's just chomp anything? I did however take one of the more aggressive f8's back to the pet store today, unfortunately. I was told to remove one as I have a 29 gallon tank and I should only have 2 f8's in that size. How long should I keep the puffers out the big tank to try the approach I mentioned previously? A few hours, a day, a week? I think this will be the last msg from me for a while now. Keep well, and happy new year. I know you have had this question before. I feel a bit dumb asking but I have had so many conflicting answers. He is in a 29gal brackish tank at the moment. Yes, I researched before buying him. My husband actually makes jokes about how I research and write everything down planning my set-ups down to exactly what and where things will go. I keep a log of the water conditions as well lol. Anyway, I plan on moving him to a 55gal in about six months. Right now he is all alone. He has been the whole time. I have been wanting to add an F8 or two for a while and have not done it yet because of all of the conflicting things said about them during my research. So I am wanting to get your opinion on the subject. I have really wanted one or two puffers for over a year! I am at the point that I will set up another tank if need be! I would prefer to be able to have it/them in with my goby if possible. <Well, Figure-8s do vary in personality, and some are quite peaceful. You might choose to try the combination out, and see what happens. Any signs of fin-nipping on the Violet Goby, and the puffer would need to be rehomed. together for a few months with the goby in his 29gal or if I should wait till I have the 55 established. I was also thinking about putting a small school (6-8) of Celebes Rainbow in the 55 once it's established. The info I have on them is conflicted (as to whether or not they are brackish) as well though so I am at a loss and need you opinion. I wanted to thank you for your quick response! It took a lot of bucket rinsing but I think it was worth it. So, I think I will pass on the CRs neither of my aquariums are a good place for them. I have another 55 but it is an Amazon type set up. Soft water, slightly acidic for my tetras. I have blue, green fire, and diamond tetras in there with 6 Cory cats. I am going to go ahead with the puffers but I am going to slowly turn my other 29gal sick tank into another brackish set up (ironically my DGs tank started out as a sick tank for my tetras but I changed it for him) incase the puffers decide to start in on my DG. I want to make sure I have a place for them just in case. I would cry if I lost my DG! I have had this 29gal set up for the tetras but I have not had to use it at all in the two years that I have had the tetras. I haven't lost one of them yet! So, now my question is... How do I slowly raise the hardness and salinity without crashing the biological filter? I have lots of experience with FW (tetras, African cichlids that sort of fish) but my DG is the first BW fish I have had. With him he was sold in FW so I just put about a cup of Instant Ocean in every other week till his water was at 1.005-1.008. I had some plants in there with him that just so happened to be salt tolerable. I want to acclimate the sick tank before I get the puffers just in case. Should I do it the same way or should I do it different? I know the puffers need an established set up so I would also like to know of changing the hardness/salinity will make the aquarium unstable for a while? I didn't have and problems with Gimpy (my DG lol) but he started out in FW anyway. I think I will pass on other tank mates at the moment as well. I am staring to think about maybe adding some Mollies to it once I have the 55 established. 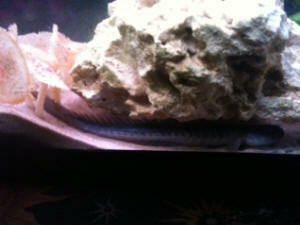 <An excellent choice, especially if you can get true Giant Sailfin Mollies, which are massive (females 15 cm/6 inches!) beasts with beautiful colours. I was also wondering about BBGs. Would they be compatible with my DG? Would they nip at the Mollies if I got some? My LFS also carries Knight Gobies. Would any of those be compatible with my DG or F8s? I can easily forget about the Mollies if I would be able to put one or two or more of these guys (BBGs or KGs) any thoughts? Ok, I am going to go ahead with the KGs and Black Mollies. The LFS I go to keeps both of these in BW already. I do find it strange though that he keeps GSP and F8 puffers, KG, BBG and live baring fish in BW (each group in their own tank with their required salinity) but not the DG he and I have argued about that a little. I know he should know better! He claims that the people he gets them from say that it's not true that they need brackish water. Is there anything I can tell him to read to prove to him that they need BW? I know he cares about the fish he sells he's just misinformed. (And unfortunately will not listen to me because he knows more than me in other areas. I have straight out told him that I am always open to new info and he should be as well. That when it comes to this I know more because I have done extensive research) What kind of cover should I get for the KGs? My DG has his places but I want to add more for the KG. I also want to know how many of the KGs I can put in the 29 and how many more I could add once they are in the 55. Also, I don't have much in the way of taller cover for the mollies and the F8s I have a lot of ground cover just not anything above 6in except the java fern. And some Anacharis and Anubias (they are at/under 6in though). Someone in the puffer forum suggested fake mangrove roots and I am going to check them out today at PetSmart (I am also going to see if my favorite LFS carries them) but I would also like some other options in case I don't like the way they look. I am going to wait until the other tank is ready before getting the F8s. Nice thanks! I will check out that crypt you mentioned and am currently looking into the hornwort. I am not sure which of the two species you mentioned are what Gimpy is. I am going to send you a pic if I can get a halfway decent one to send to see if you can tell. I don't have a background on his tank nor is it up against the wall. I have it so that it can be looked at from three sides. It makes it easier to see him. I am assuming then that when you say 6 KGs together that it is for the 55. Which is great! I was holding I could put 2 in the 29 for now and maybe 2 more when I get the 55 done. That way they have more room. I won't mind them eating Molly fry. Less population overload. A lot of what you are saying they eat I already have for Gimpy! All I need is the tilapia, squid, mussel and prawn! Everything else is already in my freezer lol. I don't usually feed live food. I don't want to have to worry about parasites. Do they eat ghost shrimp? I do have a few of those in with Gimpy. I don't really care if they do but I am curious. Thank you so much for those links! I am going to give them to the guy at my LFS so that hopefully he will take it upon himself to advance his knowledge. I have never understood why people are so strange when it comes to being corrected. How else you we supposed to learn anything otherwise? Anyway, would you be able to give me your opinion on which of the two species you think Gimpy is? I have a 90 gallon low-end brackish tank, sg fluctuates between 1.003 and 1.005. I inherited a disparate group of fish about a year ago that I've been trying to accommodate. 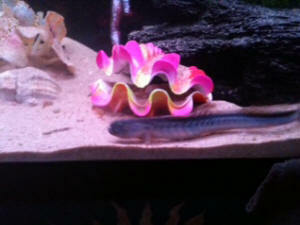 In this particular tank, I have one archer (Toxotes jaculatrix), a tire track eel and a fire eel. The eels are both 8" long. The eels seem to tolerate the salinity--do you think this will be OK long-term? Conversely, do you think the archer will be happy in this level of salinity? The archer seems very happy at the moment (it's probably about 1 year old). I realize I'm compromising a bit from either side of the salinity scale with these fish. Next, I have a scourge of Malaysian trumpet snails in this tank. I am toying with getting a figure 8 puffer for the tank because 1) I love puffers and I understand figure 8's are low-end brackish and less aggressive than other puffers; 2) I don't see much in the tank at any given moment except for the archer because the eels hide; 3) I would like to control the snail population. Thanks for your help in advance. I appreciate your time. I'll check out Assassin Snails. Luckily I don't have algae in this tank, but I am trying to find the right amount of food/feeding times for the eels. I've probably been overfeeding the eels. They seem so temperamental and unpredictable. I understand they shouldn't eat every day and will sometimes go for a couple of weeks without eating, but this makes me nervous! I don't want them to starve. I probably just need to calm down about it! By the way, I searched but couldn't find how long it takes for a fire eel to reach full size--do you know? Thanks, Neale, this is very helpful indeed. I think I may start looking to re-home the fire eel now. Thanks for the info on my spiny eel Neale, but I think Bob forwarded along this message because of the last part. I'm wondering if you have ever heard of tiger bumble bee gobies? Are they any different than a regular bumble bee goby? The gobies are not going in with the eel, they will be housed in a 20G brackish tank most likely with a F8 puffer or two. Sorry I must ask. Would you not keep two Tetraodon biocellatus for fear of them bullying one another? I have it over filtered, the back fully fake planted, a very complex mangrove stump root deco, a ceramic cave and a ceramic small log all tucked in nicely so that there is still plenty of open ground.... substrate is aragonite sand. Also there is a good visual breakup from one side of the tank to the other. I looked into getting a 30G tank specifically for this application however on this very site it is said multiple times that a good rule of thumb for F8s is 10 gallon per fish. I read and read and read some more but there is always differing opinions, apparently even between crew members. I guess I'll just do one, but beware that on the F8 FAQs it mentions the 10G/per fish rule quite often. Also, I value everything I read and everything I get emailed on here very very much, the last email was not meant as a I'm right you're wrong email. It's just a little frustration coming out since I thought I did everything right with this 20G brackish tank I set up. I had my little heart set on a pair of F8 puffers and I could have just as easily got a 30G tank before I set this tank up and started the fishless cycle. I mean I even read every puffer and bumble goby FAQ on here before I did ANYTHING. My last question is sincere though, would your main issue with two F8's in a 20G tank be waste or bullying? Thank you for your input Neale. I was wondering what fish can room with f8 in a 20g tank and what foods do f8 eat? is every single type of goby brackish? thanks! with 1 figure 8 puffer (in a 20g tank I have), and I'm wondering if I could add some non fin nippers small-ish brackish fish to the tank that'll go great with the puffer. and if you could send me some feeding instructions? Hi Neale, yes thanks for the quick response. Please tell me, could that puffer have eaten all 8 and 2 the following night?? Hi, I have a 26 gallon brackish tank with 2 figure 8 puffers, a Pleco, a few snails, and tiny feeder fish. They have been together for about 3 months and seem to be doing good. However I have had several people tell me the Pleco needs to be taken out because he wont live long in the water due to the salt content. Is this true? The Puffers don't seem to eat other fish like I was told when purchasing them. I feed them bloodworms and snails, is their anything else that would balance their diet better? Also I have wanted to get a Dragon Goby and the setup is made with the perfect hiding space for him, but wanted to know if he would eat my puffers or if they would bother him too much? I attached some photos of the puffers and tank.